Interesting bits and pieces of news involving the Lehighton Boys and Girls Band and what we are doing in the community. Members of the Boy's and Girl's Band perform at local Memorial Day services. The Lehighton Boys and Girls Band, with the Lehighton Band, joined in support of the Lehighton UVO to pay honor to our veterans. The band participated in Memorial Day Services in the Lehighton area on May 30. Joseph Seemiller, a member of the Board, was on hand to observe the services, and he captured some video clips that can be seen in three parts, part 1 , part 2, and part 3. The Boy's and Girl's Band celebrates their 100 year anniversary. The Lehighton Boys and Girls Band, with many alumni, performed a joint concert to celebrate our 100 years of service to the Lehighton community and surrounding areas. For more information, go to our Anniversary page. You can also see much of the performance on YouTube here , here, and here. Boy's and Girl's Band starts practice for Fall concert. 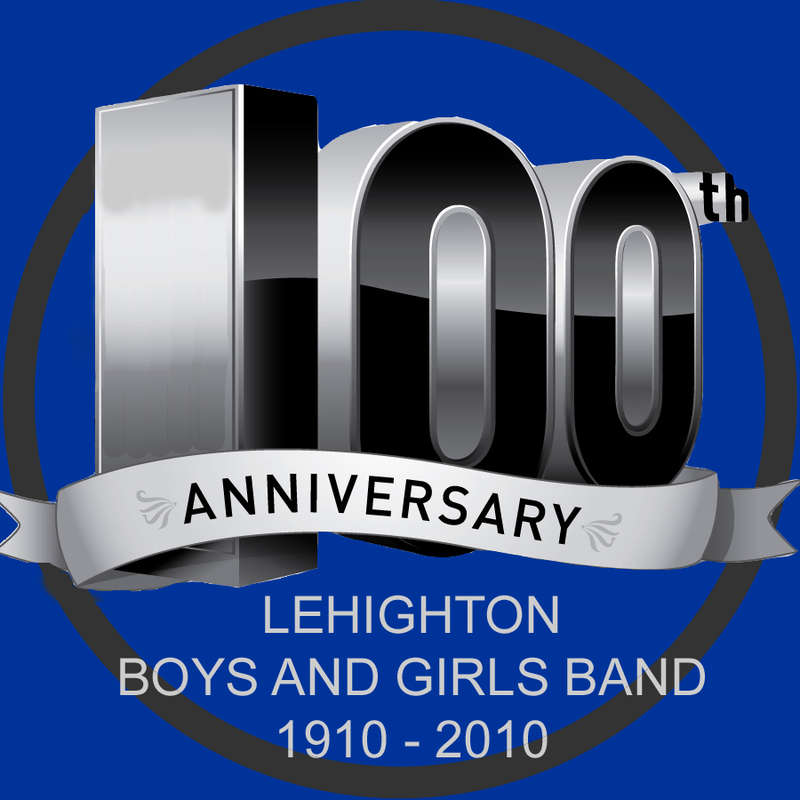 The Lehighton Boys and Girls Band began their rehearsals for their 100th Anniversary Concert recently with an outdoor rehearsal followed by a picnic and swim party. The concert will be held on November 27, 2010, with the Boys and Girls Band and the Boys and Girls Band Alumni Band performing. Keep checking our web site for updates and more information on the concert. Alumni who would like to be part of the Alumni Band should email us at LehightonBoysAndGirlsBand@GMail.com to be included in concert mailings. Boy's and Girl's Band performs with Lehighton Band. The Lehighton Boys and Girls Band joined forces with the Lehighton Band to perform in the 'Concert in the Park' series. The band performed some selections, the Lehighton Band performed some selections, and then the Band's combined their forces for a joint performance. The Lehighton Boys and Girls Band joined in support of the Lehighton UVO to pay honor to our veterans. The band participated in Memorial Day Services in the Lehighton area on May 30 and 31. On Sunday, the band performed at St. John’s Cemetery (Mahoning Township), Ben Salem Cemetery (East Penn Township), Dinkey Memorial Cemetery (Ashfield) and Packerton Cemetery (Packerton). On Monday, the band performed at the Union Hill Cemetery, marched in the Lehighton Memorial Day Parade, performed at the Lehighton Cemetery and played at the flag-raising ceremony at the Lehighton American Legion Post. We are also proud of band member Katie S. for being the speaker at the Packerton Cemetery. Members of the Boy's and Girl's Band perform at Side By Side Concert. Four members of the Lehighton Boys and Girls Band performed with the Allentown Band in their recent Side by Side concert at Symphony Hall in Allentown. They joined fifty other high school band members from the Lehigh Valley area performing with the Allentown Band under Allentown Band conductor Ronald Demkee and guest conductor Captain Dae Kim, assistant conductor of the United States Military Academy Band at West Point. Also performing on the program was euphonium soloist SFC Jason Ham, also a member of the USMA Band. SFC Ham graciously took a few moments before the concert to explain multiphonics (the very difficult technique of playing multiple pitches so you can play harmony with yourself) to our euphonium player, Zach. Pictured are (l to r): SFC Jason Ham, Zach K., Katie S., Carol A., Thomas F., Captain Dae Kim. The Boy's and Girl's Band perform at PASR's Spring Luncheon. Seven members of the Lehighton Boys and Girls Band provided entertainment at the Pennsylvania Association of School Retirees (PASR) Spring Luncheon, held at the Blue Ridge Country Club recently. Carol A. and Laura C. each performed solos, Katie S. and Peter P. performed two jazz duets, and Corey G., Adam R., and Zach K. performed two trios in the rock idiom. Pictured are (l to r): Katie S., Carol A., Laura C., Peter P., Adam R., Corey G., and Zach K.
The Boy's and Girl's Band asked to perform at pool dedication. Members of the Lehighton Boys and Girls Band met with Denny Seiwell at the Carbon county Band 50th Anniversary Concert. Denny Seiwell is a former member of the Lehighton Boys Band, and has played for Paul McCartney, Art Garfunkel, and James Brown, to name a few. (see Denny's biography here). Students are (l to r): front: Samantha B., Rebekah F., Daniel F., Katie S., Cera B. back: Zach K., Adam R., Denny Seiwell, Thomas F., Carol A.